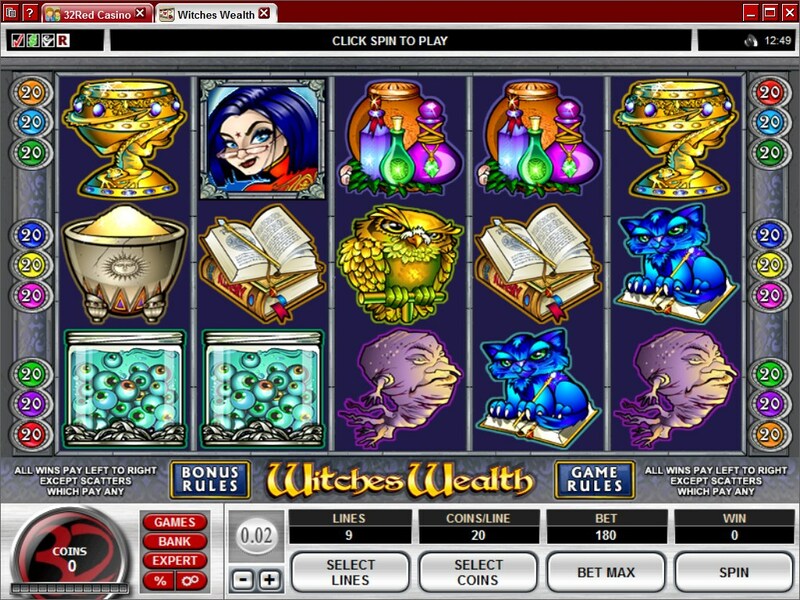 Witches Wealth does what a lot of other slot machines have done before, mixing a theme that could work very well on its own with another one, related to riches of various kinds. 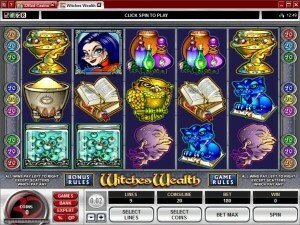 You get a very wealthy witch in this game, which is an approach I haven’t seen before in slots that deal with witchcraft. There are all the usual elements of design that you would expect from such a slot, plus others that are more gold related, like the witch is also a bit into alchemy. The developer that thought up this game is Microgaming. 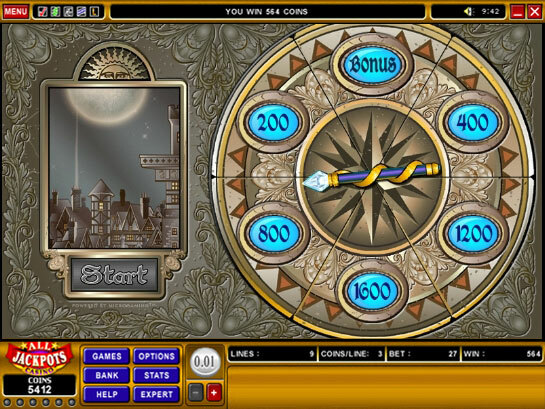 A game that looks good, this slot nevertheless appears to be an older title, with only 9 bet lines available in a 5 reel setup. There are both regular features (wild, scatter) and some that are quite cool, with a double bonus game which has two levels that you can take advantage of. Top payouts of $30,000 are also available. The wilds and the scatters are the symbols which you expect to see, but there is also a bonus symbol which can trigger two different bonus games, depending on how many of them are present on a payline. The witch, which is a girl called Serena, with blue hair and wearing eye glasses, was chosen to act as the wild in this case. The wild symbol is appreciated by all players, for the simple reason that a game which includes it will be more profitable. The substitution ability of the wild will do this, allowing it to take the same role as other symbols which are trying to form combinations on the paylines where this one appears. As long as the symbol is needed in the location where the wild landed, it will take that role and you will get a prize you wouldn’t have received otherwise. The wild can’t substitute for the Mr Twinkles bonus symbol, but nothing is mentioned about substituting for the scattered Bat. Multiple Serena symbols, landing on the same line, will give you combinations that pay anywhere between 5x and 6,000x (for two to five wilds in the combo). The Bat is the only scatter symbol of this game, with the only role attributed to it being that of a trigger for some prizes. Getting scattered symbols with Bats on them will trigger prizes, which vary between 2x the bet for three Bars, and 50x for five. Now, a bonus symbol also exists in this game. It has to appear with 3 to 5 Mr. Twinkles (the blue cat) on the same active line in order for it to give you something. You have two bonus games that come from the same symbol, though you get one or the other, never both. The first of the bonus games needs either 3 or 4 bonus symbols with Mr. Twinkles on an active bet line. 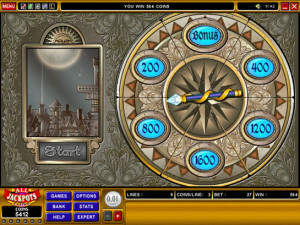 You get a new screen, with a wand that you spin on a wheel of fortune of sorts. You get a cash prize or you gain access to the next level of the bonus game, to Flying Rescue. The Flying Rescue feature can get triggered in one of two ways. 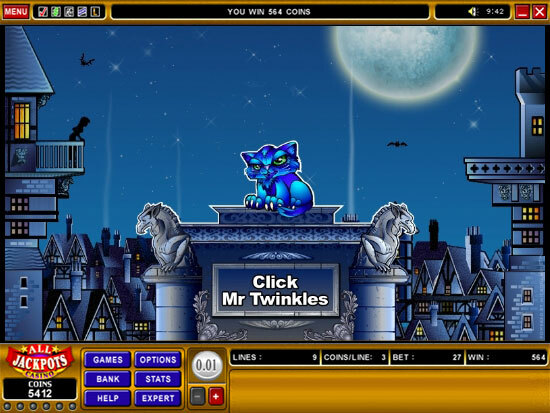 You can either gain access to it through the Spinning Wand feature, or you can enter it directly if you have five Mr. Twinkles bonus icons on a payline. Here, you are asked to dodge various objects that are falling, in your attempt to save Mr. Twinkles, which will also double the mystery prize value when you reach him. Manage to go all the way and reach home, and you get triple the usual winnings. With the game having only 9 lines, you don’t get a chance to use huge bets, but they are at least average since they reach $45. The line bet is at $5 when everything is maxed out, meaning that you use all 20 coins available and each one has a denomination of $0.25. 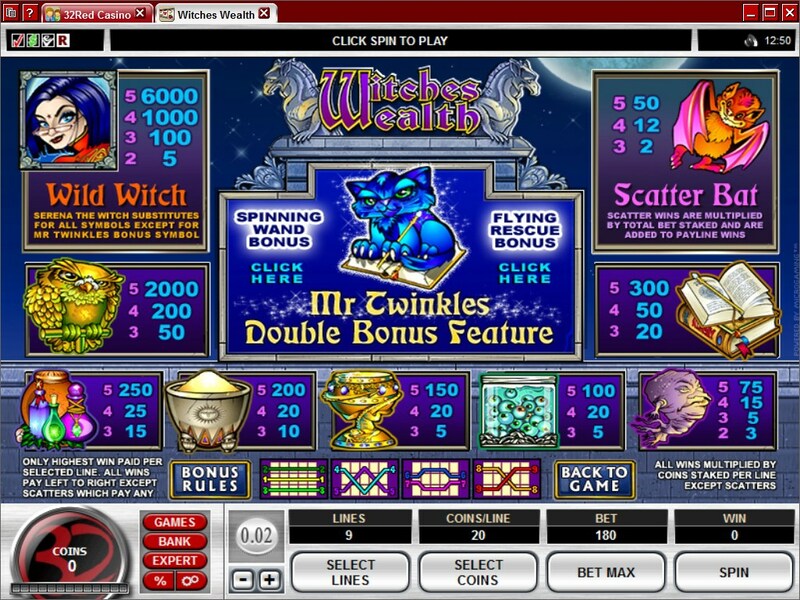 With the wild symbol taking over a bet line, meaning that five Witches are present on it, you can expect a prize worth 6,000x the line bet, which means up to 120,000 coins or $30,000. Despite this being a witch inspired theme, you’re not getting the scary vibe at all. It’s more like you’re watching a TV show where Serena the witch is the star. The symbols mix the usual witch stuff (eyeballs floating in jars, potions, spell books) with a bit of alchemy and gold items, to justify the “wealth” part of the title. It’s a decent game graphics wise, but definitely not a very modern one. Symbols: Serena the Witch (wild, 6,000x), Bat (scatter, 50x the wager), Mr. Twinkles (bonus), Owl (2,000x), Spell Books (300x), Potions (250x), Gold Dust (200x), Gold Goblet (150x), Eyeballs (100x) and Mandrake Root (75x). The game’s features are the ones that are truly attractive, the design being pretty good as well, but not great. The small number of paylines is one of the things that I have a problem with, but the game is good enough to warrant at least a look. 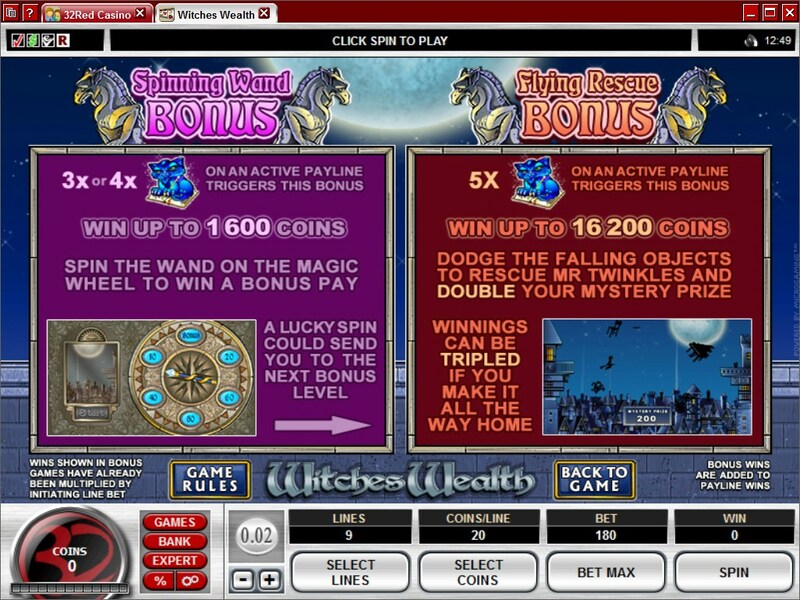 You will find Witches Wealth at any online casino which chooses to use software from Microgaming, playable either for free or for real money.